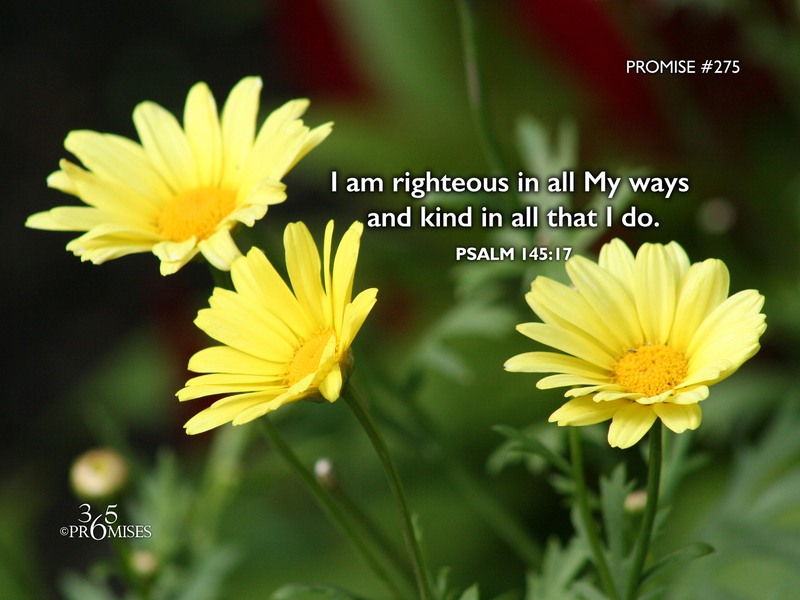 I am righteous in all My ways and kind in all that I do. I really like how the NIV Bible says this verse... The LORD is righteous in all his ways and loving toward all he has made. The NLT says that God is 'filled with kindness'. Isn't it wonderful that the God that we are in relationship with is not only righteous and holy but He is also the kindest person in the universe? When Satan tempted Adam and Eve in the Garden of Eden, He actually planted a seed in them to question of the goodness of God. "Did God really say..." May we never fall for that trap! May we always keep in the forefront of our thoughts and prayers that our God and Father is good and His mercy endures forever. ...And may we continue to live a life of reverence and awe that our Heavenly Dad is righteous in all His ways and His heart is filled with love towards all that He has created.